According to Audrey Mae’s artistically designed cemetery map and Audrey Mae’s gravestone numbering system in her Spencer Historical Family Cemetery, Lilly Bell’s gravestone is Gravestone Number Forty-Six. 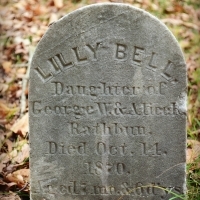 Lilly Bell is the daughter of Roby Alice (née Spencer) and George Rathbun. Using her Smith-Corona typewriter in the 1980s, Audrey Mae typed the following mini-biography of Lilly Bell Rathbun, a ninth-generation Spencer in East Greenwich, Rhode Island through her mother, Roby Alice (née Spencer) Rathbun. 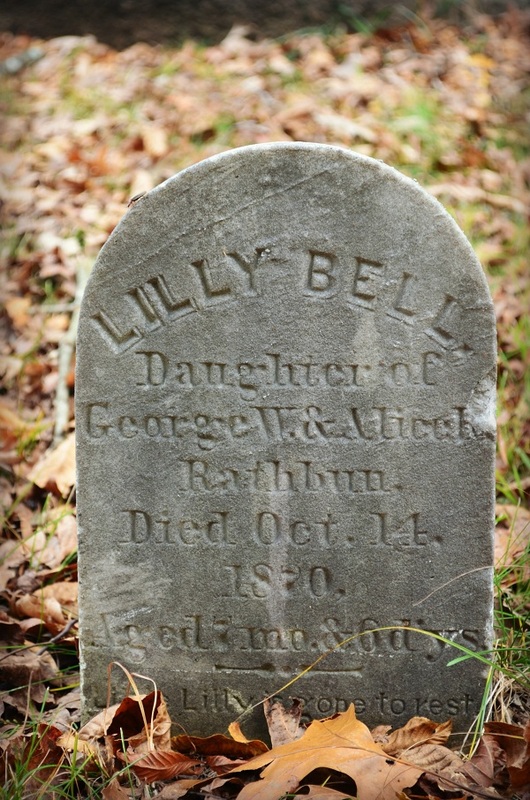 Lilly Bell’s mother, Roby Alice, has the same first name as Roby (née Tarbox) Spencer (Gravestone No. 5), the spouse of Richard Anthony (“Deacon”) Spencer (Gravestone No. 6). Lilly Bell’s mother, Roby Alice is a descendant of that couple. Audra Eleanor is the first daughter of “Deacon” and Roby Spencer and Lilly Bell’s mother, Roby Alice is a daughter of Audra Eleanor. Lilly Bell’s brothers in the Spencer Family Cemetery are Marcus (No. 45) and Alphonse (No.47). The two Rathbun brothers, (George–Gravestone No. 49 and John– Gravestone No. 58) married the two Spencer sisters, (Evelyn –Gravestone No. 57 and Roby Alice–Gravestone No. 48). 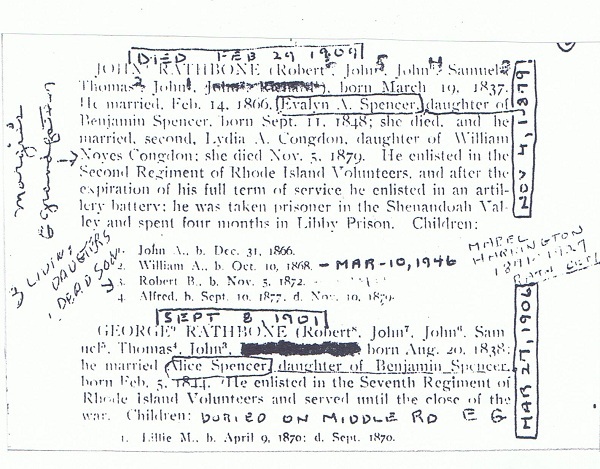 According to the above article on the Rathbone (sic) genealogy, the Spencer sisters are the daughters of Benjamin (gravestone No. 54) and Audra (gravestone No. 53). Audrey Mae’s daughter, Crystal, met one of the Rathbun descendants who gave her copies of the above articles.